The top five electric vehicle launches at this week’s Shanghai Motor Show. Audi plans to go into production with the model in 2019. Audi revealed its second all-electric concept at the Shanghai Motor Show as it announced plans for it to go into production in 2019. 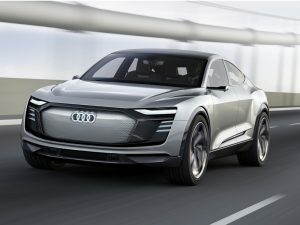 Joining the production version of the e-tron quattro SUV concept that arrives in 2018, the four-door Gran Turismo Audi e-tron Sportback concept is similar in size to the Audi A7 and uses an electric drive configuration that Audi said will also be adopted in future production all-electric models. This features an electric motor on the front axle while two on the rear power all four wheels, providing a total 429bhp output. As a result the concept is capable of reaching 62mph in 4.5 seconds and covering in excess of 310 miles. I.D. Crozz concept car features a 311-mile range. Volkswagen took the wraps off its I.D. Crozz crossover, which it says will go into production in 2020. Set to play a key role in the brand’s plans for annual sales of one million EVs by 2025, the I.D. Crozz concept car features a 311-mile range, all-wheel drive and autopilot mode. The third member of the carmaker’s electric I.D. family alongside the I.D. – which is also scheduled to start production from 2020 – and the I.D. Buzz MPV, the I.D. Crozz is based on Volkswagen’s MEB modular EV platform, which enables it to offer the same space as the new Tiguan Allspace seven-seat MPV despite being more compact. Combined power stands at 302bhp, giving the concept at a top speed of 112mph and can cover up to 311 miles on one charge on the NEDC cycle. The battery can be charged to 80% of its energy capacity in 30 minutes using a fast-charging system. CMA Battery Electric Vehicle Technical Concept Study. Volvo’s first electric car will be built in China and sold globally from 2019. 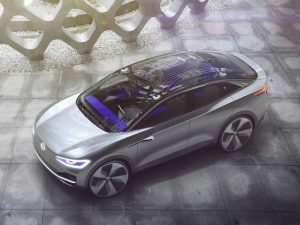 At the Shanghai Motor Show, the carmaker revealed that the electric car will be based on Volvo’s Compact Modular Architecture (CMA) for smaller cars, which will also underpin the forthcoming XC40 and S40, which it has already confirmed will get a T5 Twin Engine plug-in hybrid, using a three-cylinder petrol engine, and a fully electric drivetrain. Volvo is also developing a fully electric car on its Scalable Product Architecture (SPA) and is also planning to launch plug-in hybrid versions of every model. By 2025, the brand aims to sell a total of 1m electrified cars – including fully electric cars and hybrids. 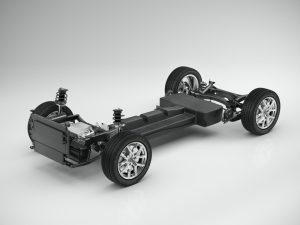 Vision E is based on the MEB platform for electric vehicles. 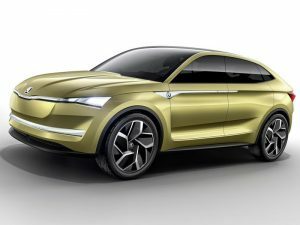 Skoda has previewed plans for a production electric vehicle with the unveiling of its Vision E concept. Debuted at the Shanghai Motor Show, the five-door crossover coupe is based on the Volkswagen Group’s MEB platform for electric vehicles, which is also used for Volkswagen’s I.D. Crozz, and is similar in size to the Kodiaq. Power comes from two electric engines with a total system output of 302bhp and a top speed of 112mph. Range is up to 311 miles on the NEDC cycle. Skoda plans to launch its first electric vehicle in 2020 following the launch of the plug-in hybrid Superb in 2019. The brand aims to have five pure electric vehicles in various segments in 2025, by which date one in every four cars sold by the brand worldwide is likely to be a plug-in hybrid or pure electric vehicle. The Vision E also previews the brand’s future plans for design as well as autonomous driving – the concept meets level 3 requirements, which means it can operate independently in traffic jams, go into autopilot on motorways, stay in lane and swerve, carry out overtaking manoeuvres, independently search for free parking spaces and park and leave parking spaces by itself. C5 Aircross launches in China in the second half of this year and Europe in 2018. 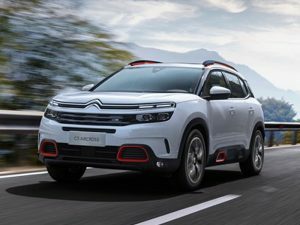 Marking out as the first Citroën to feature the Plug-In Hybrid PHEV e-AWD drivetrain, Citroen’s C5 Aircross SUV has debuted at Shanghai. Providing a rival to models such as the Qashqai and Ateca, the SUV will join the range in 2018 and, in PHEV form, combines a 197bhp petrol engine and two electric motors, with a total output of 296bhp. In all electric mode this will have a range up to 37 miles – it will also offer hybrid, combined and 4×4 functions. Citroën has also announced 163 and 197bhp petrol engines will be available along with the EAT6 e-shift automatic gearbox and the European line-up is also likely to include two and four-wheel drive diesels. Built on PSA’s EMP2 platform, the new model will introduce a new suspension system that uses Progressive Hydraulic Cushions said to bring significant improvements in ride comfort. The C5 Aircross launches in China in the second half of this year and in Europe in 2018.